Which is why today I’m going to talk to you about a long-term survival play: protecting yourself from Cancer. This subject really hits home for me, as it’s something that is on my radar in a big way… You see, my dad died of skin cancer when I was 22. Melanoma is a very aggressive form of cancer, and for him it started with a mole that metastasized (turned nasty). This is an easy thing to recognize and prevent, if you know how… And that’s what I’ll be sharing with you today. Since my dad’s passing, I’ve been to countless dermatologists, and had probably 20+ moles removed from my body. (Sadly, we’re a moley-group in my family). In my many visits, I’ve learned what dermatologists call the “A,B,C,D’s” of detecting a potentially threatening mole. When you look at a mole, look for these 4 things. Any one by itself isn’t cause for much alarm. Two or more should raise a red flag. 3 or more and you should go see a dermatologist immediately. Obviously if you see a mole with all 4, get it removed and tested ASAP. B stands for Border… Most moles have a smooth, even border around their outer perimeter. If you have a mole with a rough, uneven border, take note. Now it’s impossible to tell what event or series of causes trigger a cancer to develop… But there are things that we know for sure… Prolonged exposure to the radiation of the sun without proper protection can be a huge contributing factor. The UV-A and UV-B light tends to trigger cancerous developments on the skin, including causing moles to “go bad”. 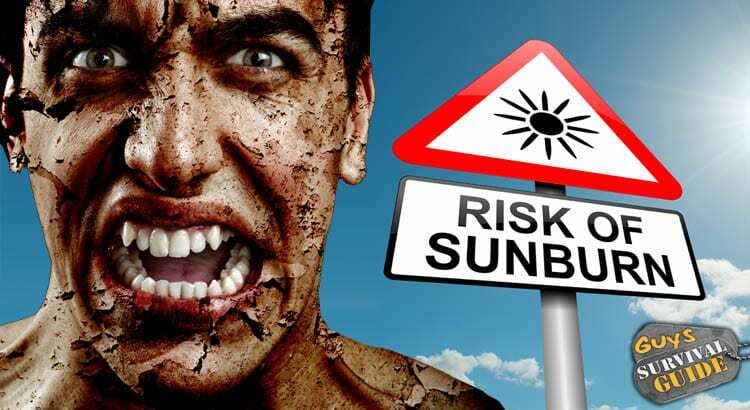 However this can largely be prevented by using UV-protecting clothing and sun-block. Some of my all-time favorite shirts are Mountain Hardwear long-sleeve adventure shirts. They’re made of great materials, have zippered pockets, mesh panels that let you breathe in warm weather, sleeves that roll up and button, and best of all, they’re UPF 30, providing sun protection. Another one of my favorite outdoor clothing lines are the pants and shirts by Bear Grylls / Craghoppers. Again, they have UPF 40+, as well as great stretch panels, non-wrinkling materials, zippered pockets (keep keys and other things from falling out) and the shirts again have the mesh venting. Their pants, made of very durable stretch-materials are by far my favorite… (I’m wearing a pair right now). And as I said, they provide solid UV protection without even putting on sunscreen. A good hat will not only protect your head and scalp, it will also protect your neck, ears and face from the sun, as well as rain and wind. 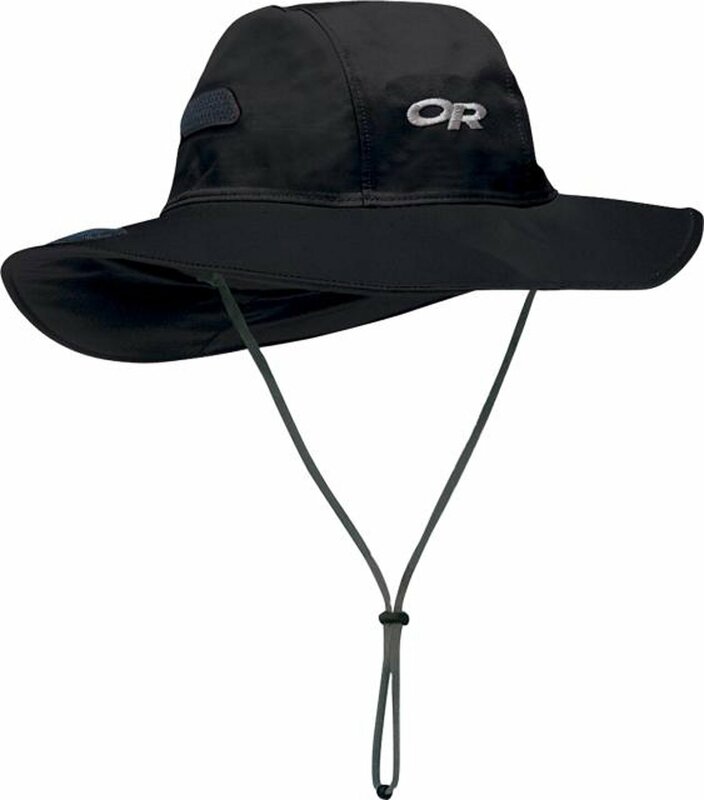 My favorite adventure hat is the Outdoor Research “Seattle Sombrero”… It’s made with GoreTex, water repellent easily shaped so it doesn’t look dorky, sides can fold up like a cowboy hat, and looks pretty cool to boot. All Terrain AquaSport SPF 30 – Rated Consumer Report’s best SPF30 sunscreen lotion (88 out of 100 points). This provides excellent UVA and UVB protection. An important aspect of this sunblock is that it’s Oxybenzone and Paraben-Free, (no point putting on sun-lotion if it has carcinogens in the cream). And for an adventure-seeker, the protection was shown to last even with full immersion. I am, by nature, somewhat lazy (and I’m not horribly flexible in the “reach your own back” category)… Which is why whenever possible I opt for spray on sunblock. Consumer Reports rated Copertone’s Sport High Performance Ultra Sweatproof spray as the best spray-sunblock… It’s waterproof and sweat-proof. When i don’t have to worry about package size constraints, this is what I use. There’s no denying it: when you’re tan, you generally look better… Your physique looks more “cut” and it’s usually a healthier look (despite the fact that it’s actually much less healthy). So I’ve learned to use self-tanning lotion in the winter when I’m getting a little to pasty-white. (The vampire look was never a good one for me). After looking around a lot for self-tanners that didn’t make me stink like a chemical experiment, I’ve found two great things. One is a self-tanning lotion that you can put on your face daily. It’s all natural and does a really good, natural job without getting TOO colored or looking at all fake. I read a ton of reviews on Amazon, and the “Nature’s Gate Glow” lotion not only had the best reviews I could find (at this writing, 35 reviews with 24 5-star and 7 4-star reviews) but it was also quite affordable. The other self-tanner that I use after a ton of research is the Banana Boat Summer Color lotion… It has a tiny bit more odor (but nothing like they used to be) and gives a nice deep tan which adjusts to your existing skin tone. The tan was very natural, and I saw a huge difference after only one application. Again, the reviews were awesome on Amazon (110 reviews with 73 5-star and 18 4-star). This one works well for the body, too dark for the face in my opinion… it also has pigment in it so you can see where you’ve applied it and where you haven’t so you don’t have missing spots. You get an instant “fake” tan from the pigment, and when you shower it off, it’s just the tan from the ingredients causing your skin pigment to change to brown. The next morning you’re pretty nicely tan. Again, this was not only very highly reviewed, but also quite inexpensive (at the time of this writing, 3 bottles for under 30 bucks). There you have it. Of course, eating anti-oxidants, avoiding deep fried foods, and not sleeping in an x-ray chamber with your head inside a microwave is also highly recommended. P.S. : Please be advised, I’m not a doctor, and this isn’t medical advice… Please consult your physician before making any decisions regarding your health. This site is for entertainment purposes only.